and we know how to catch them we don't have to look much. I needed to help Bryan do a couple things on his boat so at 11 we decided to go out and take care of his issues. While we were out Don called and said we should go catch some bait he was all over huge schools of Stripers. Naturally we could not resist so we went in search of daytime bait. Murphy's law states that if someone is catching them like Don was bait would be hard to find and it definitely was the case today. After an hour we had enough for what we needed and went out looking for fish. We tripped over a school after looking for five minutes and tried to deploy the baits before they would get hit but the fish were not liking the baits close to them and would hit them immediately. It sure was fun watching Bryan running around the boat trying to keep up with bent over rods and drags screaming. We threw about thirty away then decided to keep some for us to eat. All of this action within 45 minutes in the middle of the day, thankfully it was cloudy and a major feed was going on. Don had similar action and did not fish for long either. When we caught our bait they were done and swimming in the lake. Lake Anna is an incredible fishery with creel limits of 4 Stripers per day per person over 20 inches, twice what you can keep on the bay. We use circle hooks which allow us to catch and release most of the fish we catch without harming the fish. Fishing is just heating up and will continue to get better the next couple of months. 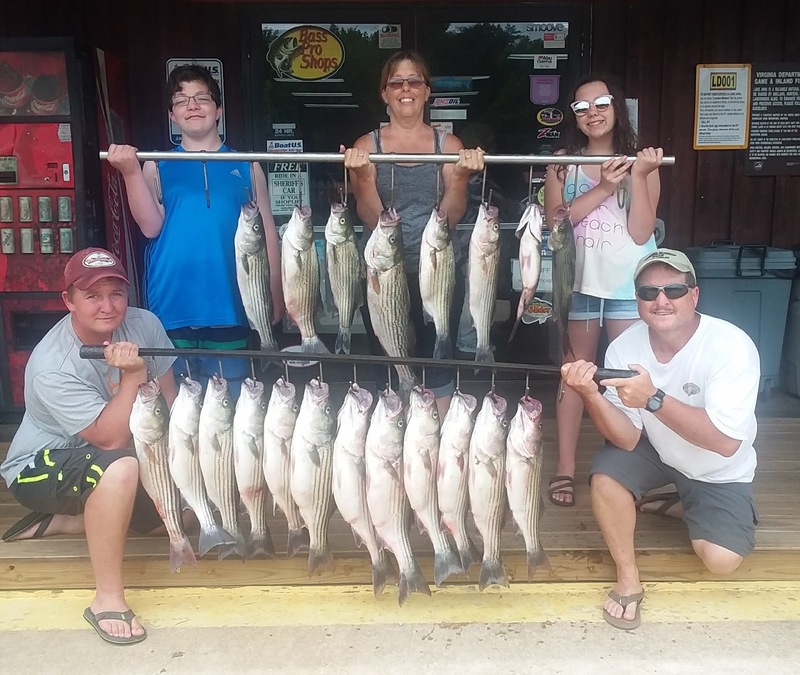 If you want to go Striper catching, contact us for a memorable morning on beautiful Lake Anna. We have the best guides with great electronics and work together to keep our clients busy reeling in Stripers.